Freshly-Made on-site at Lula Pharmacy! Come and get a FREE sample of our delicious fudge! We have dozens of great varieties, PLUS a different flavor featured every week! See just a few of our different flavors below.Need a gift and just don’t know what to buy? Give your special someone a tin of our delicious fudge! It will be one present that you KNOW they will enjoy! 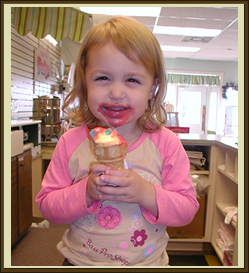 Try our hand-dipped ice cream for only $1.50! We have a great selection from Superman to Birthday Cake to Mint Chocolate Chip. We also have sorbets and sherbets, too! We can customize your wedding or party favors. Our regular favors come with raffia ribbons. If you would like stickers celebrating your wedding or party, click here for some links to websites that produce custom labels. This list of sites is for your convenience only. Lula Pharmacy is not affiliated with those businesses. Once you receive your stickers, we will be happy to place the stickers on the boxes for you for a nominal fee.